Before I start, I need you to go grab a popcorn or pee first because today, I’ll be talking about my favorite place in Scotland, a small town called St. Andrews and this is going to be a long one, a very photo heavy one! It is just 30 minutes away from Dundee by bus and on a random Sunday, Paul & I spontaneously decided to visit St. Andrews. I knew about St. Andrews from my co-workers who have visited it years ago, and that it’s a place where William and Kate studied and met. I wasn’t really expecting anything and neither did Paul. He has lived in the UK for more than 10 years and he doesn’t even know St. Andrews exist. He was so skeptical, I had to drag him so we don’t have to waste another day sleeping. We’re such lazy sloths! So we finally decided we can’t waste a rare sunny day in Scotland, we walked to our usual Sunday BBQ ribs at The Counting House. I spilled sauce on my white top, had to go back to the apartment, changed and off we went to St. Andrews. We travelled by bus which was actually pretty quick, although really really smelly. I think this is the only negative I had that day. It was just cow poop smell half of the journey from Dundee to St. Andrews and again from St. Andrews back to Dundee. Disadvantage of the countryside. Maybe, find a bus with closed windows? We finally arrived in St. Andrews and we were clueless as to where to go but Foursquare is your friend and we basically used that for directions and live tracking where we were. We decided to go first to St. Andrews Castle. You go through these little alleys until you find this road where you can see the ruins ahead. From where I was standing taking the picture above, behind me is a little gem we didn’t expect to find, it’s one of the places where William and Kate met. We didn’t know that the castle isn’t really a proper castle anymore but just ruins of it. It’s still quite lovely actually, even though they’re just basically, stones everywhere. Before you get to the ruins, you’ll have to purchase a ticket inside a little souvenir shop beside it as pictured above. We never really had a couple photo that day. Sad. Stones, beautiful stones. Beautifully architectured stones. It may look so sunny but it was actually very cold. Later on, you’ll see that I will steal the boyfriend’s jacket. Tip: Always bring one to avoid stealing someone else’s. They have these little dungeons or rooms with just a single yellow light on which felt rather creepy and claustrophobic but I don’t seem to be bothered from the photo above. And no, I don’t want to be locked up. Such a photogenic bird. It actually stood there for about a minute whilst everyone else took their cameras out for a photo op. You can see the St. Andrews Cathedral on the left side of the photo above. Later on, you’ll be able to connect the dots. This castle has existed since c. 1200 and has been in the middle of the Scottish Independence wars. Built by the Scots and taken by the English and retaken finally to ruin it so that the English won’t be able to use it anymore as a stronghold. It was also the home of James I, King of Scots where he received education from Bishop Henry Wardlaw, the founder of St. Andrews University, oldest university in Scotland. Unfortunately, St. Andrews University was under renovation when we visited and this was the only photo I was able to take with its name on it. Pity. It is also where Prince William and Kate studied, as well as Benjamin Franklin, John Witherspoon, and founding father of the United States James Wilson, three of the signatories of the Declaration of Independence of the United States of America. Walking distance from the St. Andrews Castle is the St. Andrews Cathedral. Another historical site. I forgot if we paid or not. !_! I believe there is a Castle + Cathedral ticket back in the Castle souvenir shop. No one was taking tickets in the Cathedral, anyways. Everyone got in freely, so we did as well. The east tower which you had a glimpse of earlier back in the Castle. At the right side of the cathedral grounds, you’ll see this little visitor centre where specific stones and historical pieces are stored. Whilst trying to find our next and last stop which is the botanic gardens, we found this little gem. We saw so many people lining up and we were curious. No regrets as the range of flavours this place offers is just massive and very creative. Jannetas Been serving quality gelato since 1908! Sunday Times’ top 1 ice cream parlour! 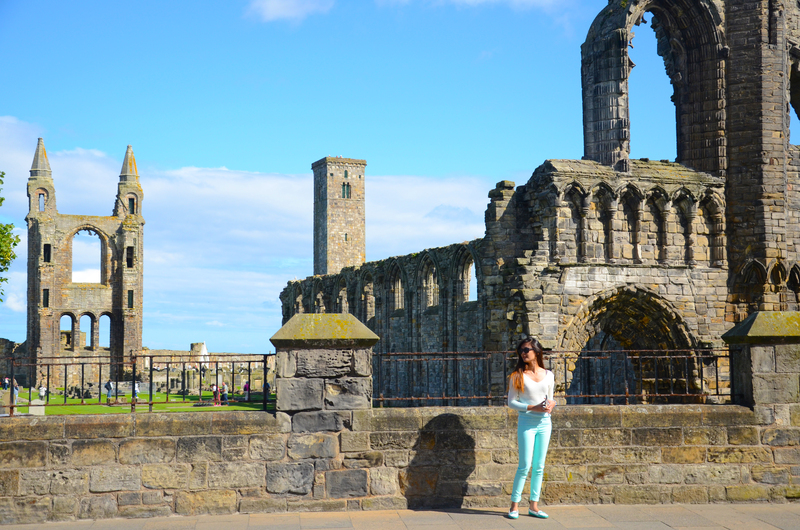 Walking around St. Andrews is really good for a non-stress getaway. Do you know that feeling of pressure to just see everything in one day as much as possible in big cities like Edinburgh and Glasgow? Well, it’s not the same if you go St. Andrews because most of the places you need to go to are just a walk away from each other. Also, there’s not much people in there and not as busy. For me, this place has become my favorite because it is such an underrated quaint little town and yet there’s so much that has happened in it. Paul & I were able to talk so much whilst navigating to the garden. He explained to me about the zig zag lines and zebra crossings (apparently, pedestrians have extra rights and you have to stop and give way or you’ll get fined) and other traffic rules. Haha We even walked behind a couple with a baby who kept laughing at us at a street behind this wall as you can see in the photo below. Also, look at this castle entrance-like for cars to go through, it’s so grand and royal-ly. I love it. I’d love to drive around small towns like this someday. From where I was standing taking the photo above, behind me is a red telephone booth, the 1st one I’ve encountered after how many weeks in Great Britain. So of course, I had to take photos even though its quite.. dirty and abandoned. We had to walk a mile or so from this phone booth to find the botanic garden. I believe its already in the residential area. After visiting Edinburgh and Glasgow, both of which had botanic gardens, this is actually the first time that I’ve ever been in one. I love how they each have a place to nurture such pretty flowers and different plants. Living in the modern world, a lot of us wouldn’t even stop to appreciate these and I think it’s nice to know that there are people who would actually take care of them and make this world a prettier place especially when all we do seem to be contributing to pollution. Actually, everywhere in Scotland, you’ll observe that there are plant boxes on the side walks with these kind of flowers. It was also my first time to see poinsettia, we don’t have them here in the Philippines but we do use it all the time to decorate our Christmas trees so it’s nice to see a real one. Not life-changing, but you know, it’s the little things. And that was it. I hope you enjoyed the photos I took and persuaded you to visit St. Andrews someday. 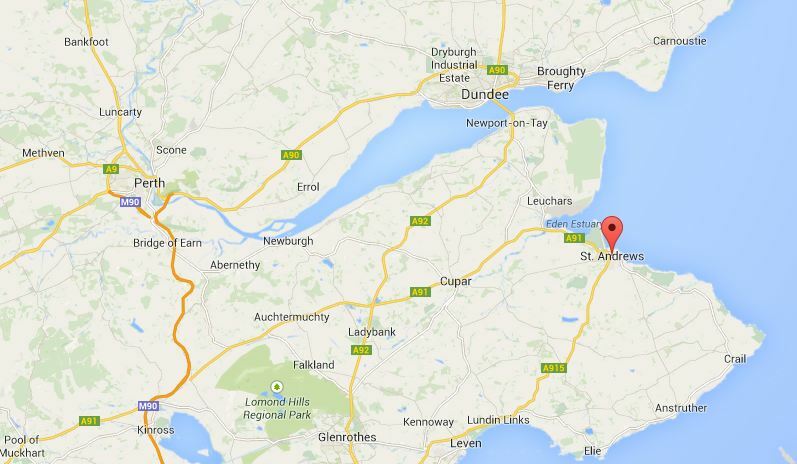 I may have mentioned St. Andrew’s name (minus the apostrophe, I know) a thousand times in this post and never explained. He is actually Scotland’s patron saint. The national emblem and flag of Scotland is St. Andrew’s cross, the Saltire. All of Scotland celebrate St. Andrew’s day on the 30th of November and considered a flag-flying day.